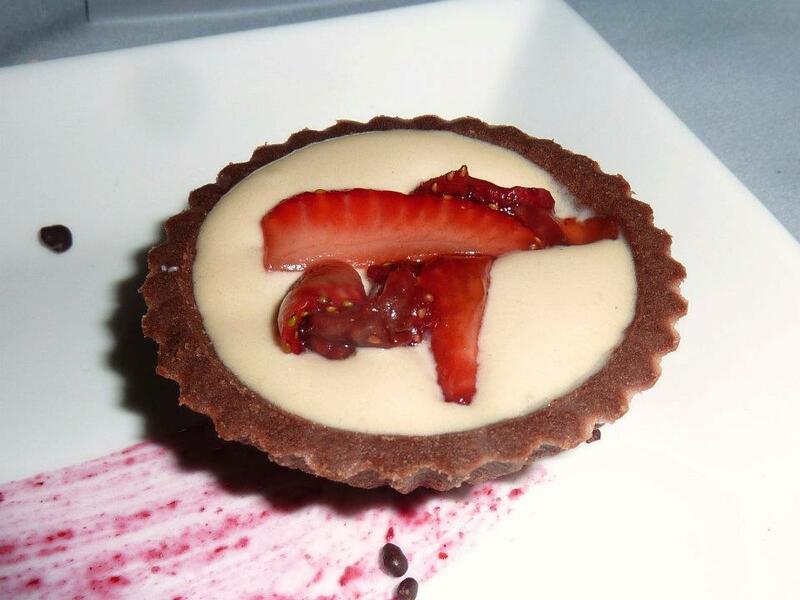 So begins another blog spiel with the tale of a young lady who won herself a Valentine’s Dinner. Another win? You are so lucky…. I’ve heard people say. I think the thing is though, it’s really a volume thing… I enter a lot. So remember that folks – you’ve gotta be in it! 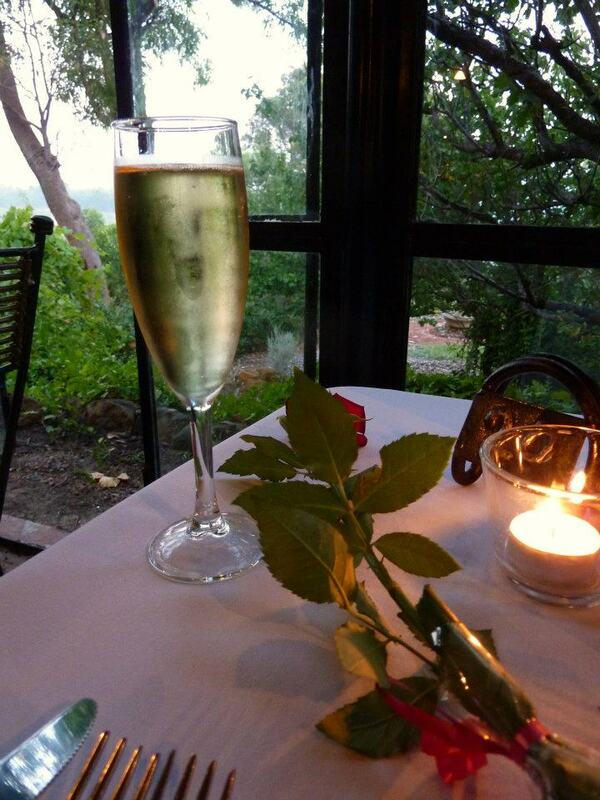 So a competition presented recently to win a dinner at Darlington Estate Winery on the “most romantic day” of the year. I entered and crossed my fingers. And yes the finger crossing paid off because I received a message that it was my name drawn out of the hat. Oh happy days! I was all the more excited when a) GG agreed to be my Valentine’s date and b) I saw the menu. It looked delicious!! 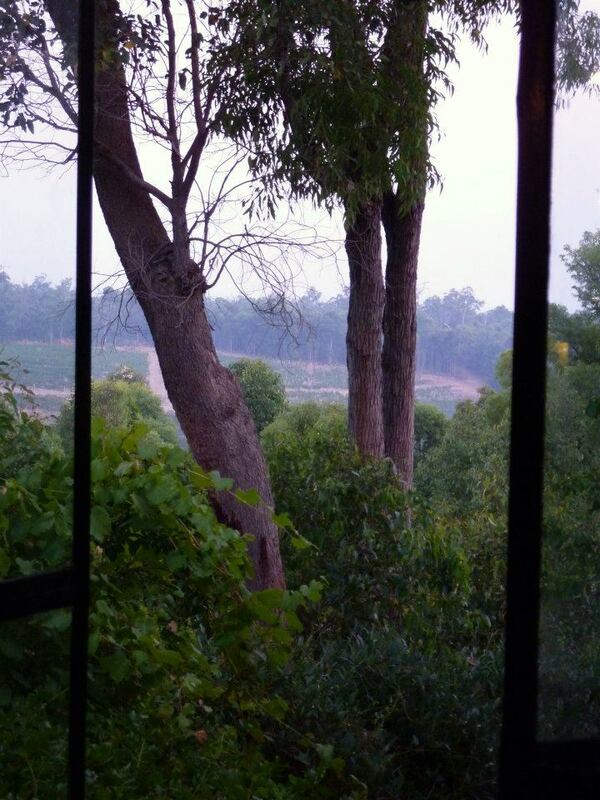 I’d been to Darlington Estate Winery years ago and had memories of it being a very pretty place, the only real downside is the distance. It’s not close to home and once you get off Greenmount Hill its quite a windy road to the restaurant. We managed to find our way there on Tuesday just a touch after 7 and it was as picturesque as I had remembered. As I saw them cross my name off the reservation list I noticed they had opted for a staggered start to people’s dining – 6.30/7.00 and 7.30. Definitely seemed like a good idea to me. A red rose was waiting for me on the table, which was all very lovely and we were also each presented with a glass of bubbles – all very special. 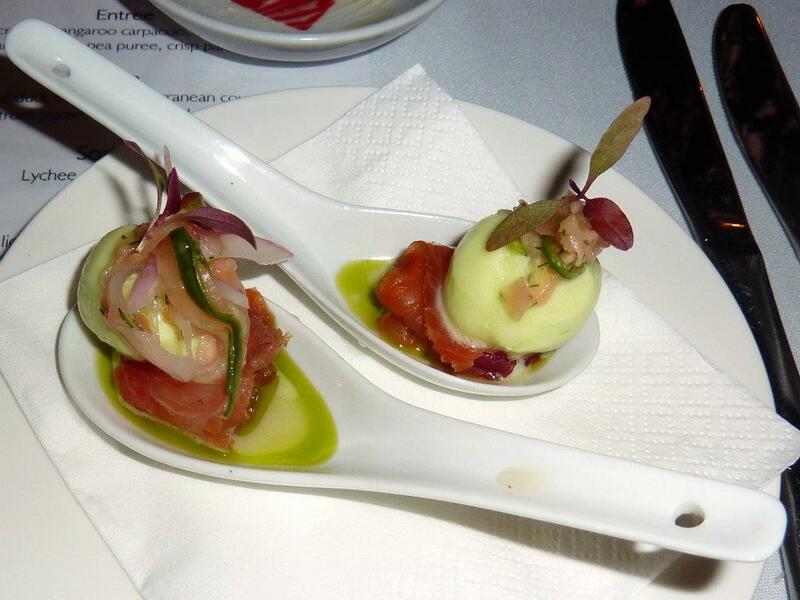 Up first was an Amuse Bouche of Beetroot and vodka cured salmon, lemon sorbet, pickled ginger. Artistically balanced on a large ceramic soup spoon it did looked very pretty. And then we ate it. Wowsers, if we had been impressed with its appearance the flavour was all the more amazing. 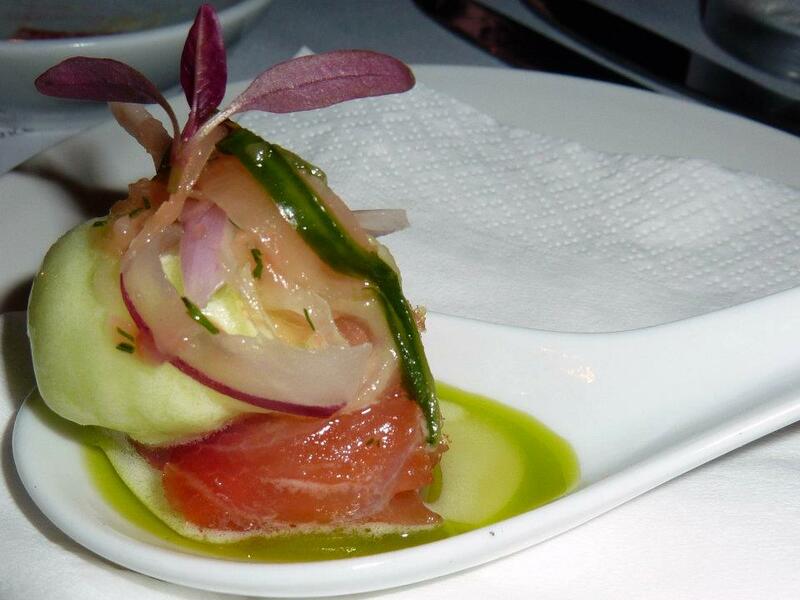 The salmon melted in your mouth, not a trace of fishy flavour (yay!) and the combination of the sweet beetroot, the refreshing chill of the lemon sorbet and the pickled ginger was just divine. How good is ginger!! One mouthful in and we were sold! Very nice food! Couldn’t wait for the next course to arrive. 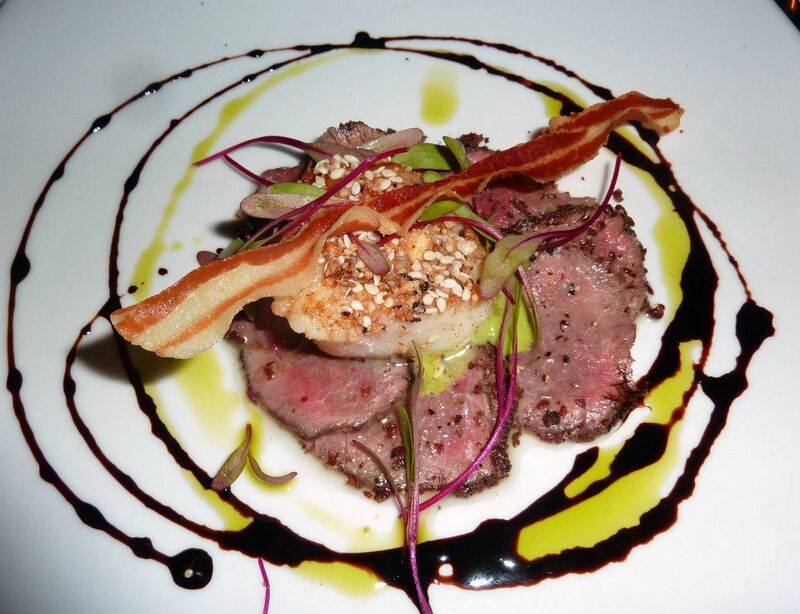 The entrée was up next – Sumac crusted kangaroo Carpaccio, dukkah crusted seared scallop, pea puree, crisp pancetta. 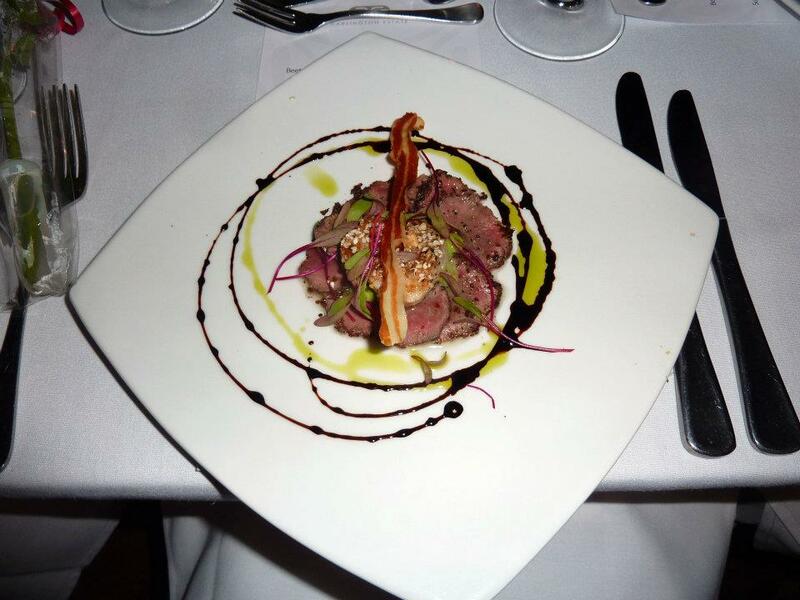 The Carpaccio was slightly thicker than I had had previously but the flavour was amazing! And scallops with Dukkah – what a revelation! Another winning combination where our only wish was that there was more of it! But we knew there were more dishes on the way and we definitely wanted to save room for them! As some of you may know 2011 was the year of the duck. I ate a lot of it and for the most part really enjoyed it! So I was in no way disappointed to see that a duck course had quacked its way into 2012. Woohoo! Let the good times roll! 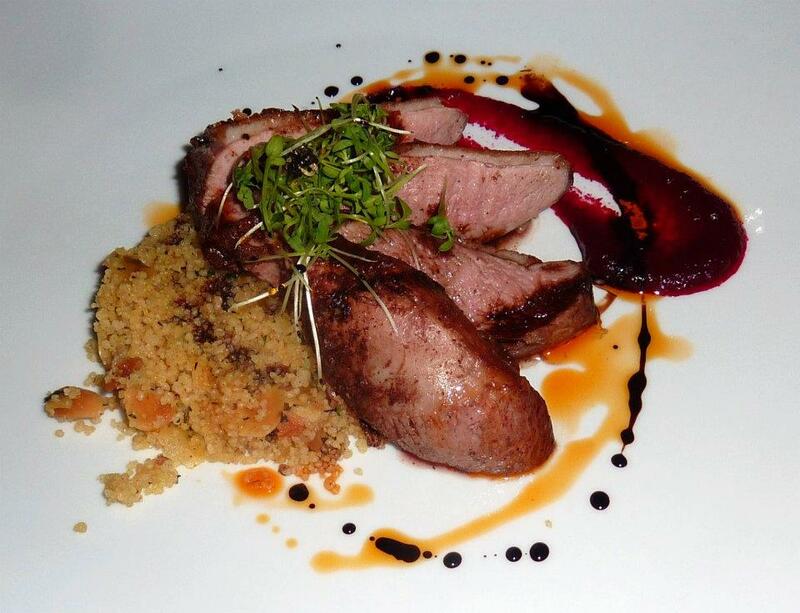 Mains was a Five spiced duck breast, Mediterranean cous-cous, beetroot puree, muscatel and shiraz jus. 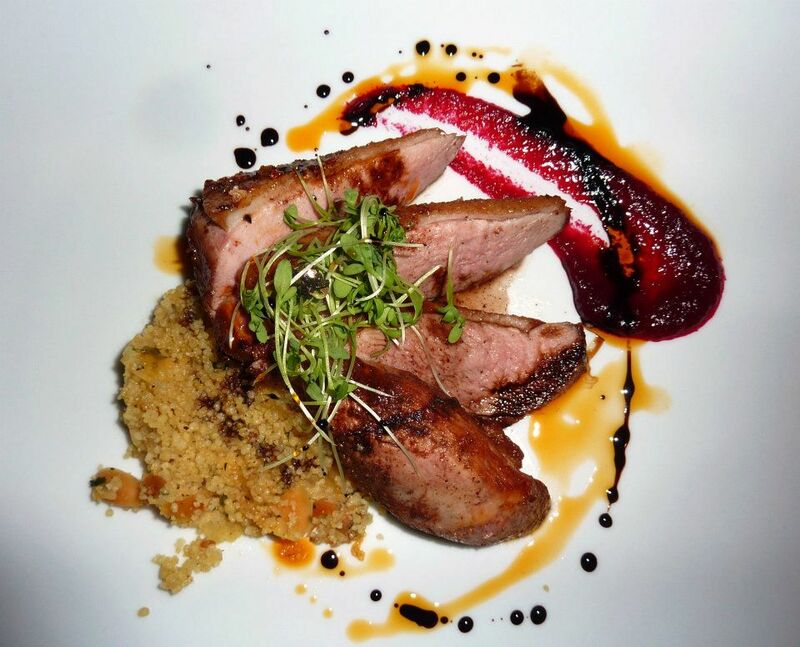 And there was a generous amount of duck on the plate that was all the more pleasing! Pink and perfectly delicious, it went well with the spicy cous cous and a little of the beetroot puree. I have a lot of time for beetroot. It’s a great addition both flavour wise and visually it adds such a nice splash of colour to any plate. 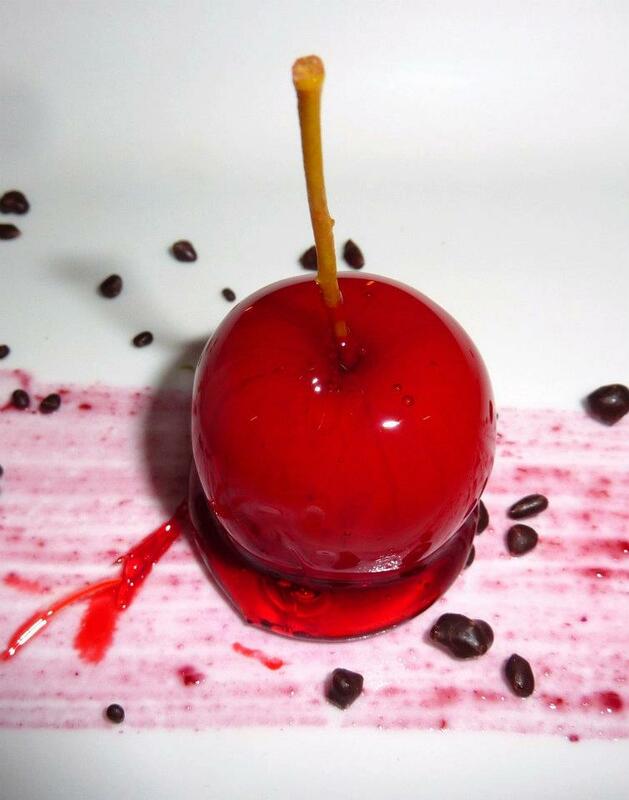 Before we turned our attention to the sweeter side of thing, always best to cleanse the palate. 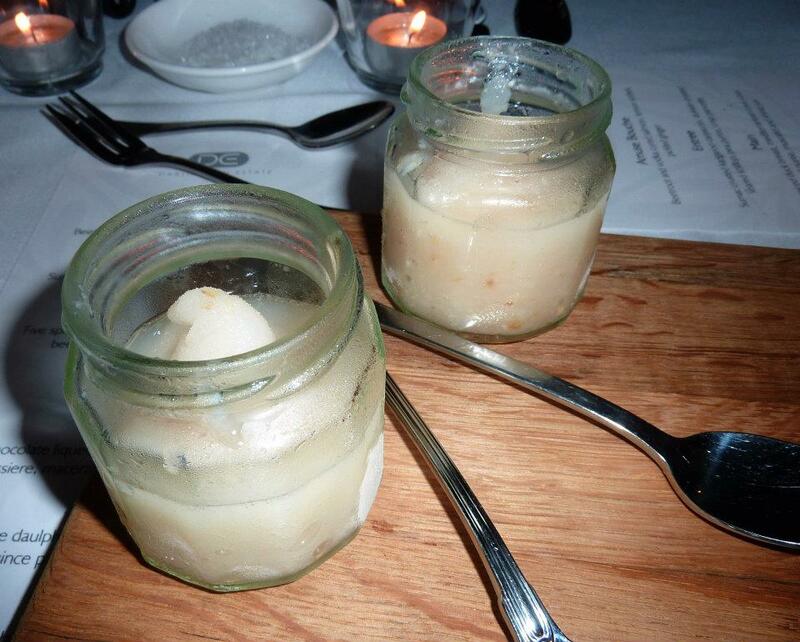 We were presented with dainty glass jars full of the most delightful lychee and rosewater sorbet. What can I say – those two flavours should be each other’s valentines because they go so well together! And I thought the presentation was precious – jars are cool! 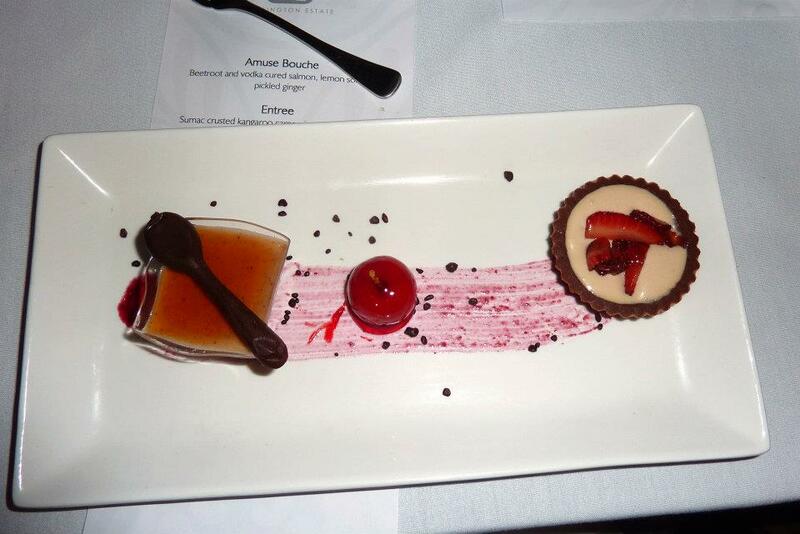 Dessert was a decadent trio of three dainty items – Chocolate liqueur crème brulee, kahlua crème patissiere, macerated strawberries, toffee apple. I started with the kahlua crème patissiere. Literally within seconds of having a dig at GG for picking it up and eating it with his hands, I shot half of the little tartlet across the table and onto my handbag on the floor, when I tried to be more ladylike and cut it with my fork. Clearly it was meant to be eaten with hands – quite hilarious really. I was glad I didn’t end up wearing it on me. Because I had a new top on – an Aurelio Costerella bargain, so I was feeling quite la di dah, but that’s really a side note. The kahlua creme filling was so delicious I was definitely glad I hadn’t thrown the whole thing on the floor! I then turned my the toffee apple. Now I cannot tell you the last time I had a toffee apple. They used to be something I would always get when I went to the Royal Show, along with a bag of fairy floss, but some how the novelty of sticky fruit wore off as I grew older……. but this looked so precious on the plate! A perfect miniature, complete with the right shade of red for the toffee. I tried to take a delicate bite but ended up with the whole thing in my mouth. Needless to say, it was another example of me trying to be lady like where it could be argued that I failed as I battled with the sticky toffee. 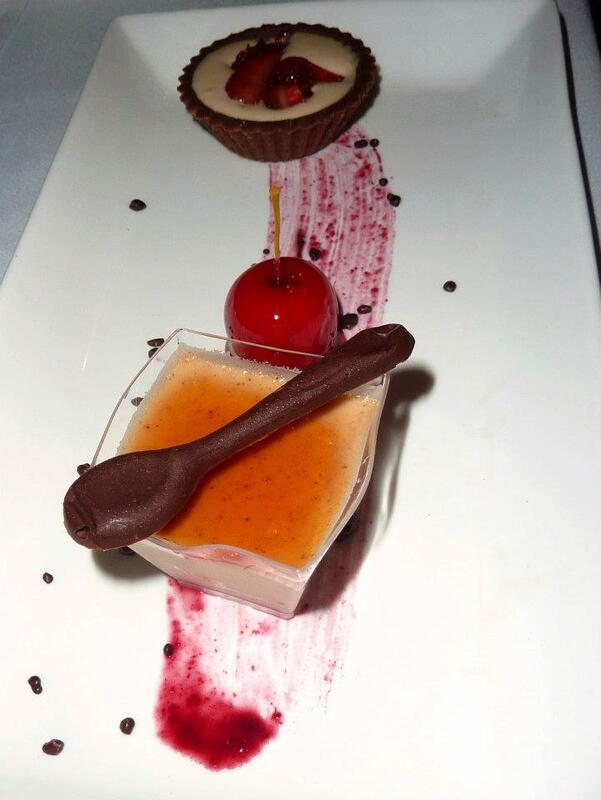 The final item on the plate was the Chocolate liqueur crème brulee. 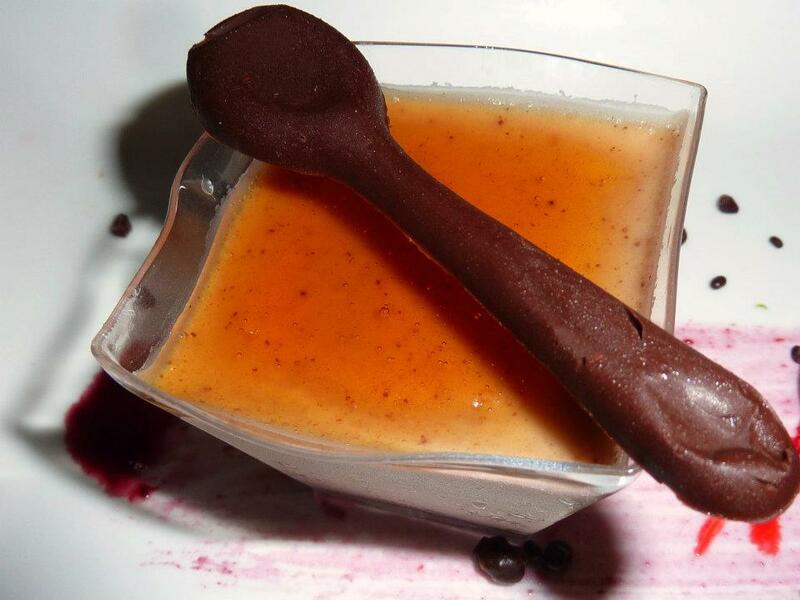 We both tried to use the tiny chocolate spoon balanced on top, but sadly this just left us with chocolaty fingers. That’s ok though. 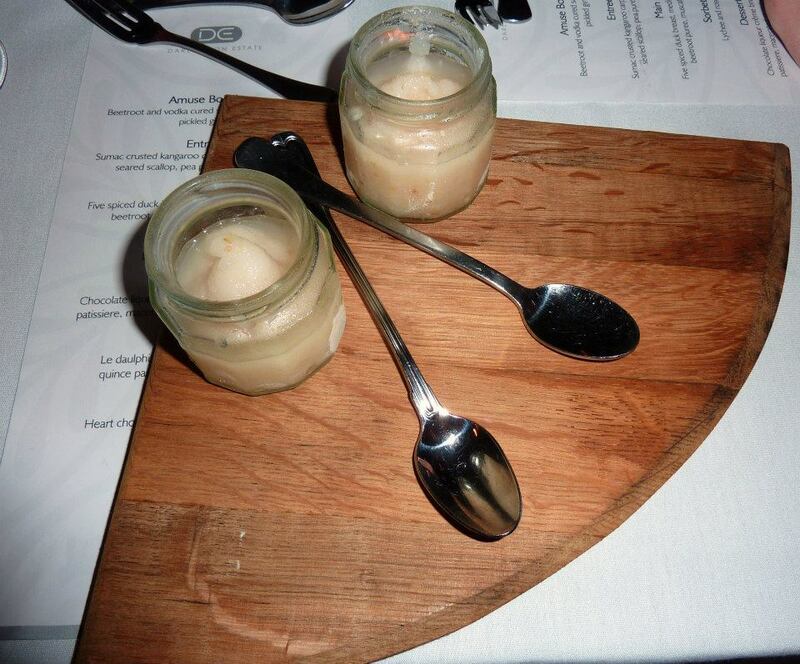 We picked up our regular spoons and enjoyed the crunch of the sugar on top and the creaminess of the brulee. It can be so difficult to assess when you first get your plate which order to eat things in a situation like this, but I’m not disappointed with the order I chose. Always nice to end on a chocolaty note. And while it can be said there is always room for dessert, I also always have room for cheese. 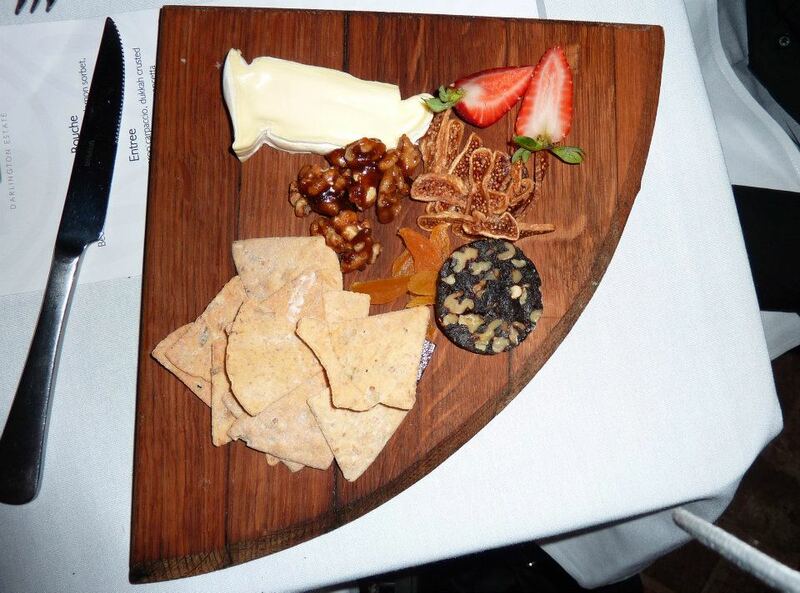 A platter was presented for us to share – Le daulphin brie, candied walnuts, quince paste, lavosh, strawberries. I suppose part of me had wished for slightly more cheese, just so there was more of a balance between the cheese and crackers and the tasty other options we had to go along with that. The brie that we were given though was indulgently soft and oh so nice! I passed on a tea or coffee but GG was bought a flat white. 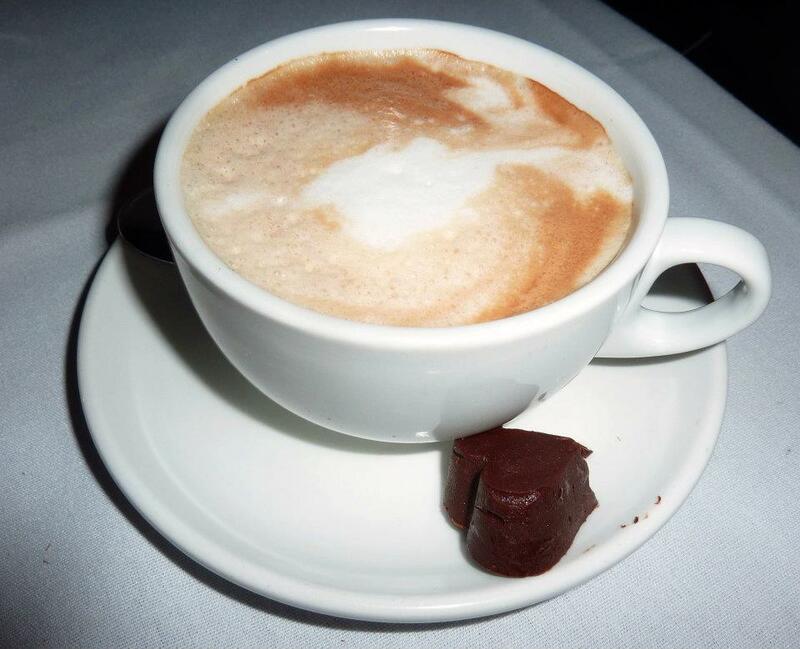 One comment would perhaps be to put the heart shaped chocolate on a little separate plate, given that as it was sat right near the hot coffee cup it had melted to the side. Though I’m told it was still a pleasant sweet treat. It had been a really lovely evening and a very special Valentine’s up at Darlington Estate with GG. As mentioned timing had been ideal (especially on a school night), service wise everyone was very attentive (there was one young lady who perhaps looked slightly down to be working on V Day but she was still pleasant) and we our evening definitely ended on a high note when the man behind the till (who I am assuming is the owner) told us that he’d include the three extra drinks we’d had as part of the prize, which I thought was incredibly generous of him.